The overall weakness continues, as expected and signaled by the deeply negative spread score. You ignore risk spreads at your peril. Scores now as negative as at depths of 2015,’11 and ‘08. However, do not expect this kind of deeply negative action to continue indefinitely. There are many signs that we are approaching at least consolidation, if not better prices in risk assets. Individual shares have been pummeled and some very bad damage has been done to a variety of leading shares that have been flying high. I encourage you to work with the Database to see if your portfolio needs to be changed in composition. High quality shares are likely to outperform high beta names. The name of the game has changed from Growth to Capital Preservation. But now there are some very good bargains. See if your favorite names have reached areas you consider as value and see how they are performing against the Benchmarks in the Database. I have nibbled at some good names, there is very little reason not to. Markets are deeply oversold and you can definitely expect bounces of good quality names. We try to continually add indicators we find reliable in the long term. 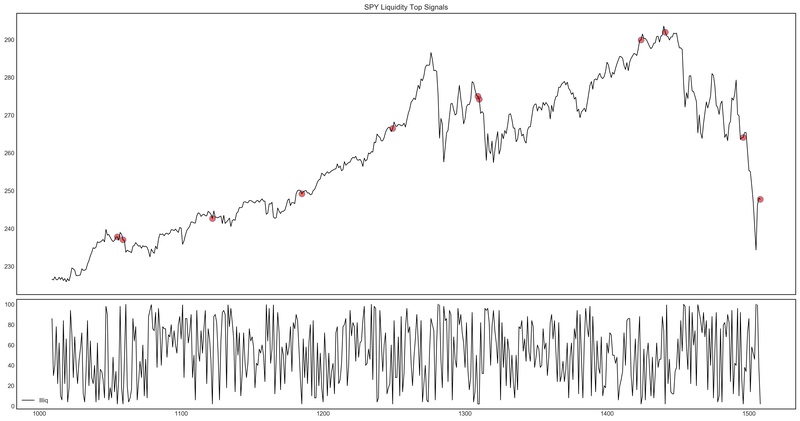 This chart of liquidity signals is one which we will follow and continue to perfect. It gave a sell signal on Friday, which indicates that the upside is limited at the moment in the indices, but suggests to me some major rotation between sectors will take place. All of the spreads you mention. They are all scored & graded in order of importance (to me). 1,000s of them. A detailed discussion is available in previous blog posts and in the FAQs page which refers you to videos about it. If that not helpful, come back and I can discuss in more detail, but I think that will give you a very good idea. my thought process is this: lets see if I can make this site self sustainable. I have tried to do it on “the cheap” as much as possible, but some things by necessity were very expensive to create. Replication/addition will be much easier & cheaper, but will require prices of tickers which cost many thousands/year. Eventually I would like to get to a US Risk model (this one), an EU model and a China model, with books of just about every ticker there is, with the corresponding database engagement. The speed of all that will largely depend on the take up and “customer response”. Anything anyone can do to publicize the site (only if they like it, of course!) will speed up all of the above developments. Thanks for your question and support.